Mood Gym is an online course that aims to help you identify and overcome problem emotions. The course which you can complete at your own pace, helps you develop good coping skills. Living life to the Full is another on line course based on the principles of Cognitive Behavioural Therapy (CBT) designed to help you develop good coping skills. Get self help provides free downloadable CBT self-help resources designed to help with anxiety, worry, depression and stress. Be Mindful is a campaign by the Mental Health Foundation. Raising awareness of the benefits of Mindfulness to help change the way we think, feel and act, by combining meditation, breathing techniques and living in the present moment. 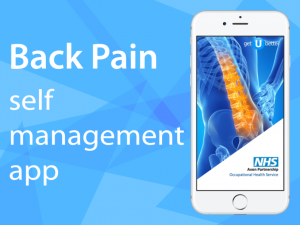 APOHS provides access to the getUBetter Back Pain self-management app to support your recovery, helping you to remain in or get back to work and hobbies as soon as possible. Start using the app for free now for 7 days. Search for getUBetter (app store or online) www.getUBetter.com. From June 2013, a new scheme, Reading Well Books on Prescription is available in libraries throughout England. This new scheme has been developed by The Reading Agency and The Society of Chief Librarians and aims to bring reading’s healing benefits to the 6 million people with anxiety, depression and other mild to moderate mental health illnesses. There is growing evidence showing that self-help reading can help people with certain mental health conditions get better. Reading Well Books on Prescription will enable GPs and mental health professionals to prescribe patients cognitive behavioural therapy through a visit to the library. Here they can get books to help them understand and manage conditions from depression to chronic pain. The scheme works within NICE guidelines, and uses 30 books endorsed by health partners as having evidenced CBT benefits.